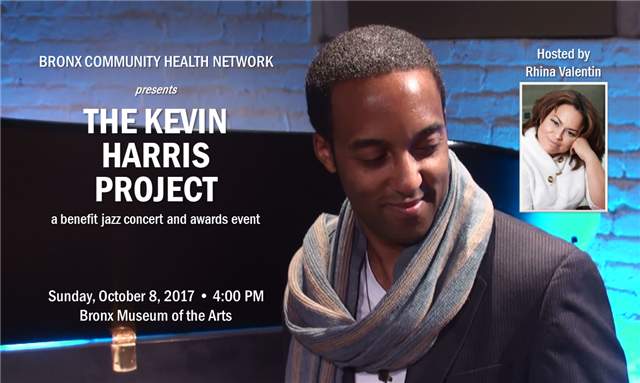 On October 8 at 4:oo PM, BCHN presents The Kevin Harris Project, a benefit jazz concert and awards event at the Bronx Museum of the Arts. BronxNet's Rhina Valentin is hosting what is sure to be a fun and entertaining afternoon. Tickets are on sale now at Eventbrite.com. 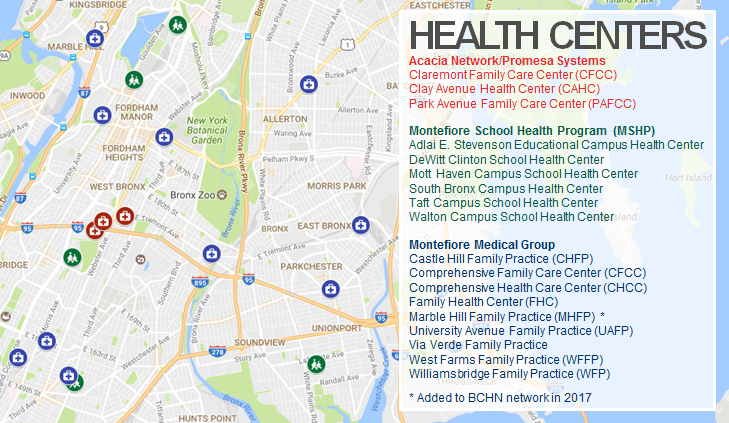 BCHN celebrates health champions every year during National Health Center Week. 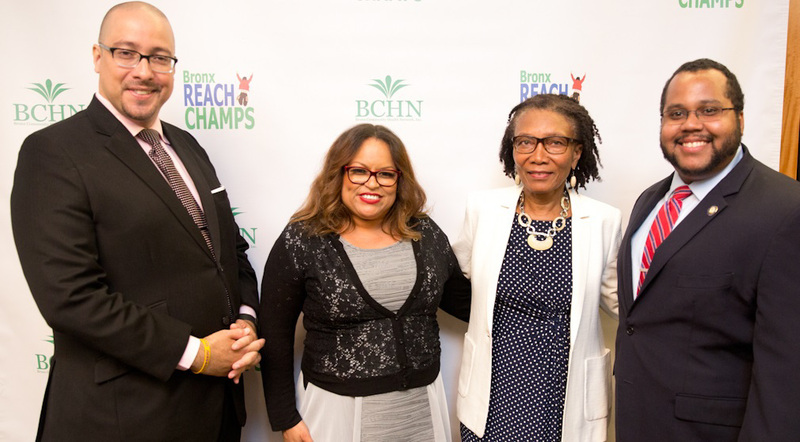 On August 17, the 12th Annual Community Health Champions Recognition Dinner was hosted by Rhina Valentin at Montefiore's Grand Hall. The evening featured inspiring patient success stories, and recognition for the work of community partners and health leaders. 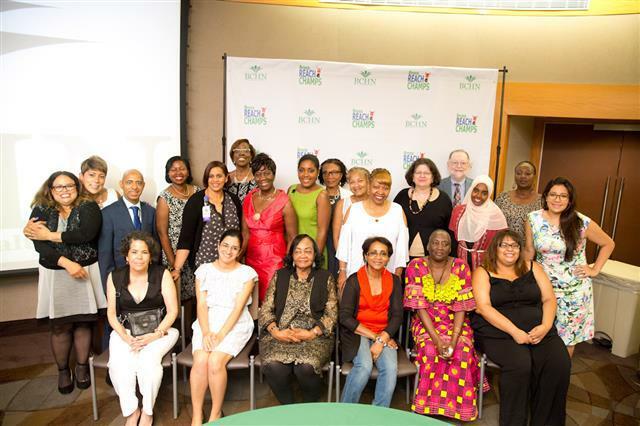 The photo above includes Rhina Valentin, CHCANYS' Roxanne Wynn-Trotman, BCHN's chief executive officer Eleanor Larrier and chief medical officer Dr. Jay Izes, and a number of this year's honorees. Note: Watch the 2017 Patient Health Champion videos here. Pictured above are Senator Gustavo Rivera, Rhina Valentin, Eleanor Larrier and Assembly Member Victor M. Pichardo. Senator Rivera and Assembly Member Pichardo spoke to the packed room about the importance of community health centers and the value of the work that BCHN does every day. 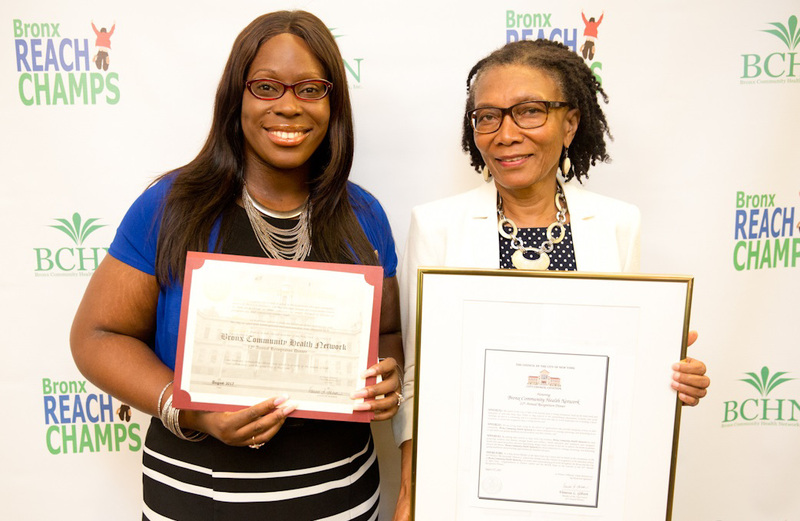 BCHN was a presented with a citation from the New York City Council by Council Member Vanessa L. Gibson. 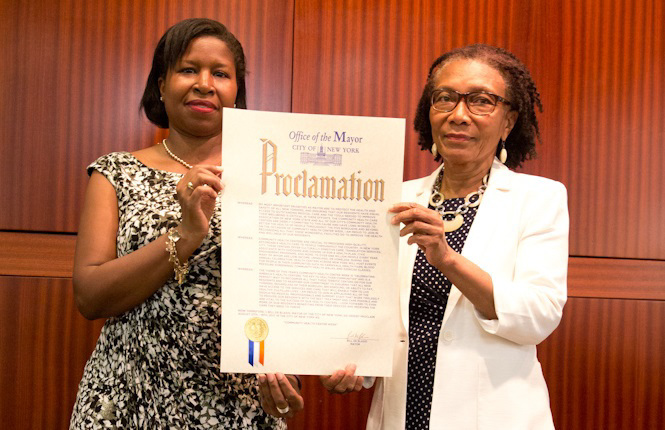 Roxanne Wynn-Trotman from CHCANYS presented BCHN with a proclamation from NYC Mayor Bill de Blasio. In the August 21st issue of City & State magazine, BCHN chief executive officer Eleanor Larrier was named one of the Bronx Influentials, 25 "behind-the-scenes movers and shakers you need to know." The Influentials were celebrated during a cocktail reception on August 24 at the Bronx Museum of the Arts. 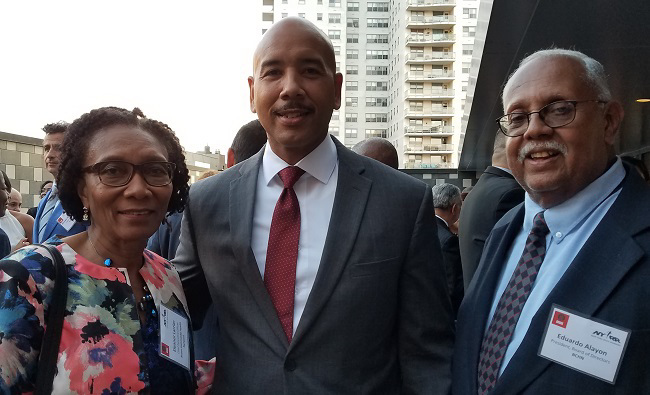 Pictured above are Ms. Larrier, Bronx Borough President Ruben Diaz Jr. and BCHN Board of Directors president Eduardo Alayon. BCHN Releases "Go Healthy at Work: A Worksite Wellness Toolkit"
BCHN has released "Go Healthy at Work: A Worksite Wellness Toolkit" in both English and Spanish. 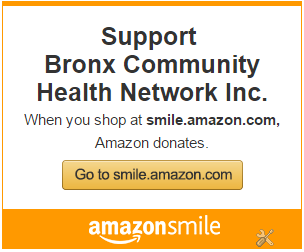 "Go Healthy at Work" was developed as part of BCHN's Bronx REACH Champs Worksite Wellness initiative. BCHN is working with the leadership of local organizations and networks to make a commitment to promote healthy nutrition habits in their work environments. 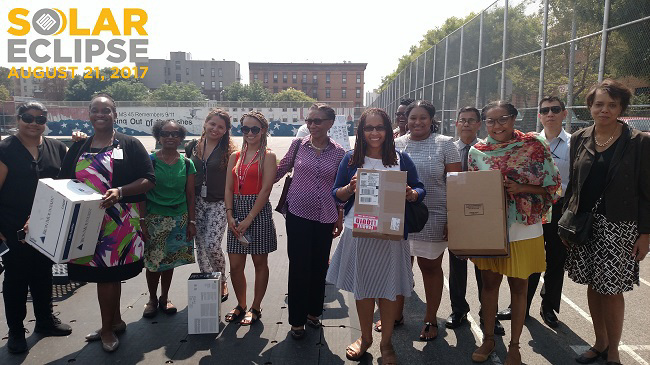 By making healthy beverage, meal and snack options available for employees, volunteers, clients and guests, organizations take an important step towards improving the overall health of Bronx residents. On August 1, BCHN and Montefiore hosted "Breathe Easy," an asthma education event to help Bronx residents treat and prevent asthma. 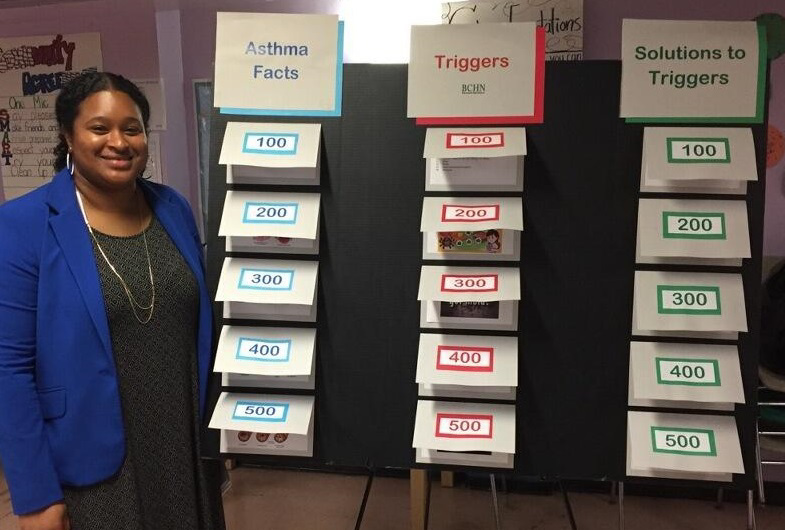 Families gathered in Eastchester Gardens Community Center to play fun games such as "Asthma Jeopardy" (pictured above with community health programs developer Renee Whiskey), and learn about resources in the Bronx to help manage asthma, a disease that disproportionately impacts the Bronx. On August 21, BCHN team members traveled to Columbus Square for a Solar Eclipse Networking Party. 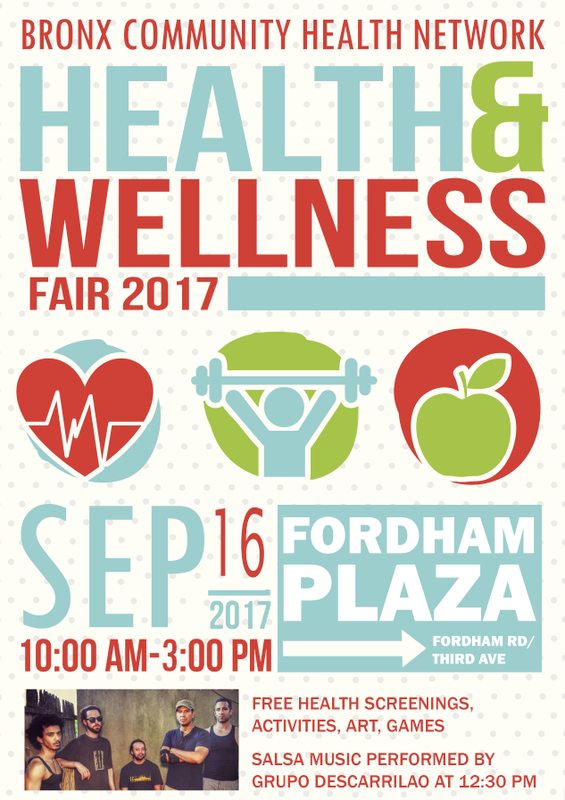 BCHN's annual health and wellness fair will be held on September 16 at Fordham Plaza from 10:00 AM to 3:00 PM. This free event will feature health screenings, activities, art, games, and salsa music performed by Grupo Descarrilao.